I walked around and found everything that was not in its right place. I took all this stuff and piled it onto my coffee table. My coffee table became a big pile of trash, dishes, clothes, books, newspapers and electronics. I dug through the pile on my coffee table one item at a time. I threw away all the garbage and broken things, stuck the books and clothes I don’t want into a bag to donate to charity, and put the things I want to keep back where they belong. That big pile of stuff was important for two reasons. It freed me to collect the junk from all around my apartment without thinking about anything other than that it wasn’t where it needed to be. This was a lot easier than trying to move things to where they belong one at a time. Once the pile was built I was surprised to see so much garbage and old things I don’t need all in one place. It turns out most of the stragglers sitting in dark corners were just junk I hadn’t dealt with. This was my inspiration to purge. 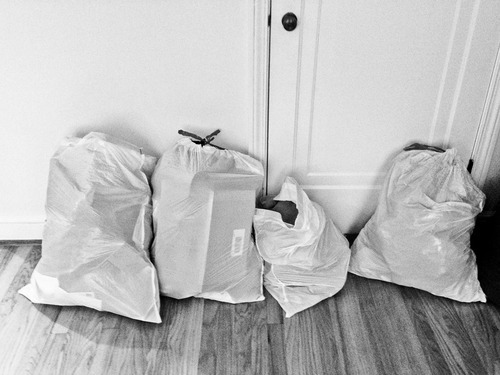 Now I’ve got two big trash bags in the dumpster and two bags of clothes and books headed to charity. This is adapted straight out of David Allen’s book Getting Things Done and I think it will make a lot more sense if you try it. I’ve used OmniFocus for years but is my first time doing GTD in the physical world. The results are great.